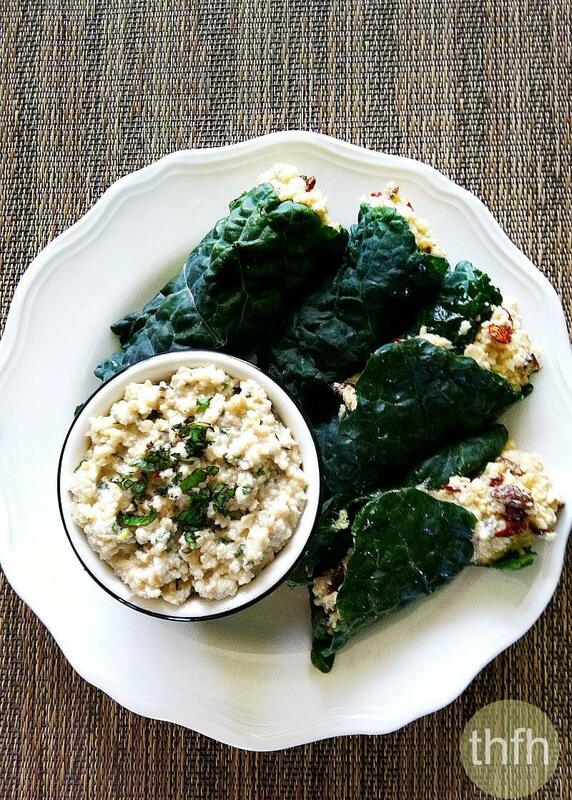 This Raw Stuffed Kale Leaves with Mint Cashew Aioli dish is a unique and delicious raw food recipe from Russell James, “The Raw Chef”. I was a little scared to make any changes to this recipe though. Did I dare to challenge perfection? Not intentionally. But after reading over the recipe ingredients, I realized I didn’t know what “vine leaves” were or where to buy them. So I opted for the next best thing…dark green kale leaves. The version of kale I bought was called “Lacinato Kale” or “Noir Chou Frise”. It is different from the regular kale I normally buy. It has longer, thinner stalks with a darker green color. And, they were fairly thin and easy to roll so they were perfect to replace the vine leaves. Even though the ingredient list looks a little long, it’s probably things you already have on hand and is just a matter of putting them into a food processor and Vitamix and then the short time to assemble them. This recipe can branch out into so many different directions. You can serve it as the wraps and dip. You can make the dip separately to serve with raw veggies. Or, you can use raw nori sheets instead of the veggie leaves to make a sushi-type roll, which is what I will do next time. Want more healthy meal and entree recipes? Check out Creamy Vegan Tomato Basil Soup, Raw Vegan Cream of Mushroom Soup, Clean Eating Zucchini Boats with Creamy Garlic Sauce, or my Clean Eating Cookbook with an entire chapter of 20 healthy, clean eating recipes just like this one that you will love! Step 1 Put the cauliflower into a food processor and pulse until it has a rice-like consistency. Transfer to a large bowl and set aside. Add all the ingredients for the stuffing (except the sun-dried tomatoes, mint leaves and raisins) into a Vitamix and blend until creamy. Add this mixture to the rice and mix well by hand. Add the sun-dried tomatoes, mint leaves and raisins to the mixture and mix again by hand. Step 2 Put all ingredients (except the mint) into a Vitamix and blend until creamy. Transfer into a small bowl and stir in the diced mint leaves by hand so that they are visible in the aioli. With a spatula, spread 1 - 2 tablespoons of the stuffing mix onto the leaf and roll them up. 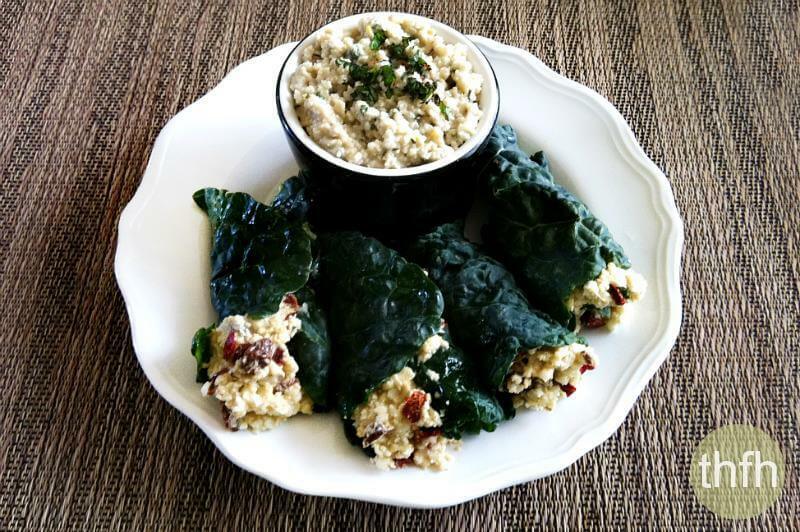 The photographs for "Raw Stuffed Kale Leaves with Mini Cashew Aioli" by Karielyn Tillman of The Healthy Family and Home are licensed under a Creative Commons Attribution-NonCommercial 4.0 International License and cannot be used without my written permission. Hey, This looks amazing & I’m sure tastes amazing as ALL your other recipes are sooooo yummy. I’ve been looking for something GF to wrap with my nori sheets. Could you substitute something else for the mint?? Or omit all together? (I don’t think my younger one will go for the mint taste.) Thanks for your time & help. Hi Keri! I think you could omit the mint completely and it would still be fine. The reason I say this is because one time I made it and did not have any fresh mint leaves on hand and I enjoyed it just the same. I would definitely not pass up trying the recipe because of the mint…it’s really good! This does look good, and it’s the perfect time of year for it since kale is still in season and mint is just starting. I’ve heard a couple of other folks mention Russell James’ recipes, looks worth investigating! I can’t have cashews, unfortunately, and they are used so much in raw cuisine. Sometimes I can use another nut like macadamia or pine nut or else soft silken tofu for a similar ‘cheesy’ effect. Hi Mary! Yes, Russell James has so many good recipes to choose from…definitely check him out. I would be completely lost if I couldn’t use cashews because you’re right, so many raw food recipes use them. I bet you could use macadamia nuts and that would taste pretty close. I’ve never tried pine nuts though.